Future Soldier design by TET. After posting the page to my social media, and with no ideas for my skate art, I thought that was that. 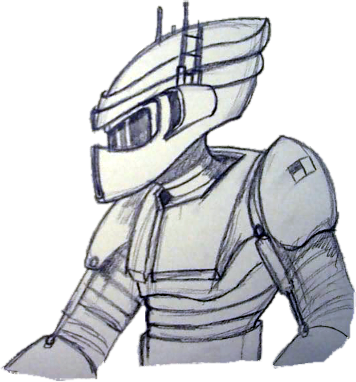 Then a comment prompted me to take a closer look at what I thought was the least successful face on the page, some kind of robot soldier, sci-fi faced character. With a little bit of a Google image search on the type of character I thought it could be developed into, I started a new page and began drawing. Three drawings later I had a pretty cool looking Future Soldier type character that wasn't something I'd set out to draw just a few days earlier. Through the process of just drawing without purpose (granted I was trying to come up with skateboard art but nothing I'd drawn related to skateboard art at all) I ended up with a cool character that I plan to develop further into a full CrazyTalk Animator 3, G3 character rig. Watch my video below to see how it all unfolded with the various drawings. It's weird how things turn out that way. Often I have made videos that I thought were not my best work and they became my most viewed and loved videos. It just happens that way.